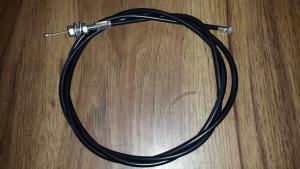 60" long Throttle cable ONLY. This cable fits the small Black lever, the Black lever is NOT included with this item. NOTE: The nut must be flush with the end as shown in the pictures to work with the Honda GX22, GX25, GX31 & GX35 engines and should fit the Huasheng 140FA 37.7 cc Four Cycle 76 mm clutch rotor - GX35 Style 1-7/8" . It has a 63" inner cable (60" outer casing) Made for the Honda GX22, GX25, GX31 and GX35. Wire dia. is .047". This cable does NOT fit the Honda GXH50 or any of the 49cc engines. It includes the 6 mm Adjusting Barrel two flat washers and two 6mm x 1.0 nuts as shown. This is the standard 60" length that fits most of our rear mount friction Drive and gear and chain drive kits. Most folding bikes use a 74" long cable, some tandems use a 90" and most trikes use a 90" long so you would need to pick the correct cable. It would be better to have a couple inches more then having it too short. Measure the length of your cable before you order.